Ever since Kristin posted this recipe, I haven’t been able to get it out of my head. The ravioli recipe is one of Giada’s, but Kristin made it look even better by pairing it with garlic infused butter sauce. And shockingly, although homemade ravioli sounds like it would be complicated and time-intensive, it’s actually really easy! 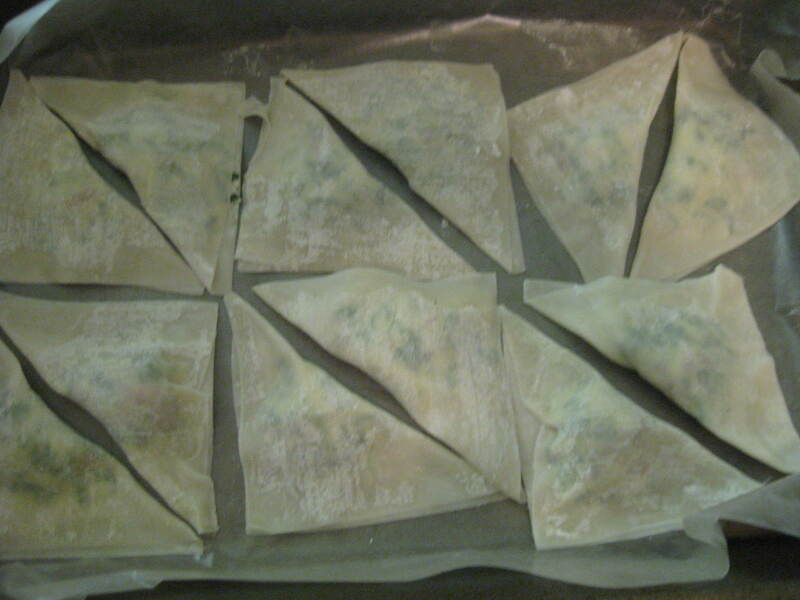 The trick is using wonton wrappers instead of making the dough from scratch. So I guess it’s not 100 percent homemade, but I’m taking baby steps here. I’ve never used wonton wrappers for anything before, but these were so easy (and fun!) to make, I might start experimenting some more with them. In my grocery store they were right next to the tofu. 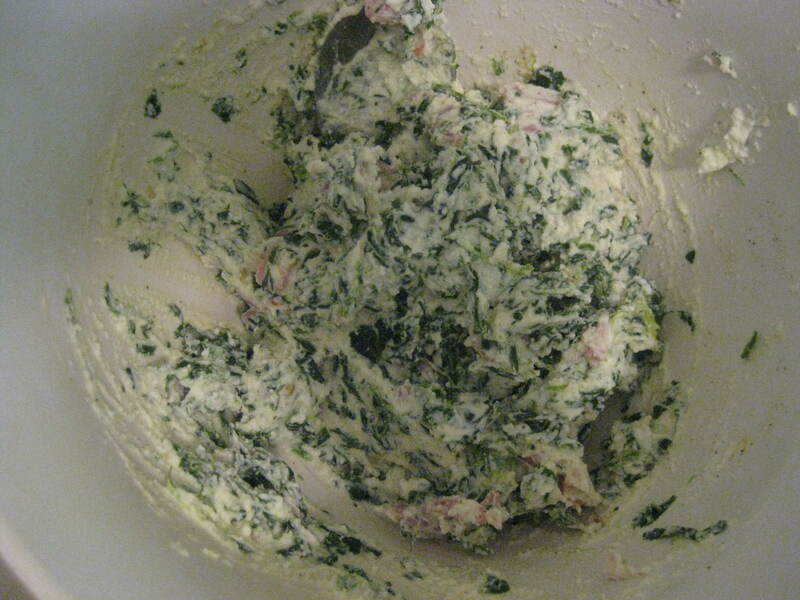 To make the filling, combine spinach, ricotta, prosciutto, an egg yolk, salt, and pepper (I halved Giada’s recipe and it was plenty for two of us, with some left over that we’re freezing for later). Then you just line up your wrappers and put about 1 tsp of filling in the middle. Brush two edges of the wrapper with water and fold the other half over into a triangle. Press around the filling to get any air bubbles out, and then press the edges down to seal it. 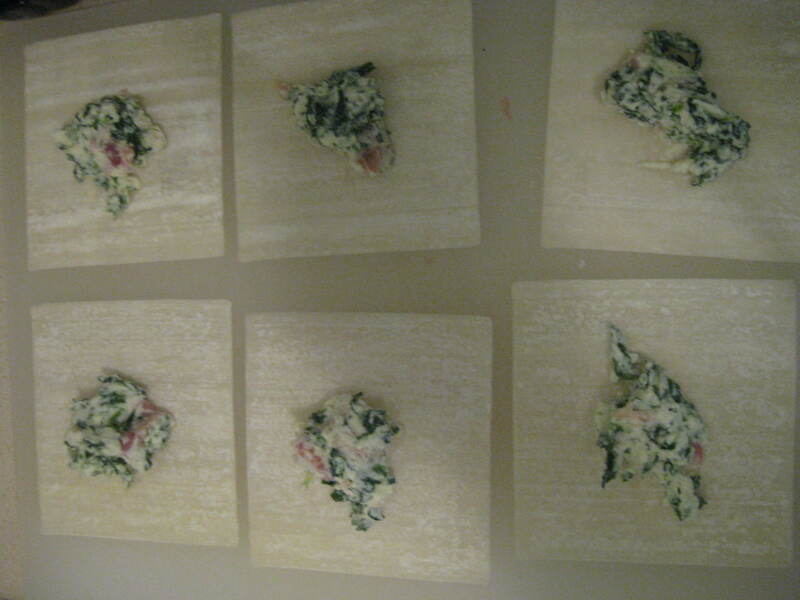 Then, either cook them immediately or place them on a cookie sheet lined with wax paper and freeze them solid. I made these earlier in the day so they were frozen by dinner time. After putting them in a pot of boiling water, they probably only took 3-4 minutes to cook. 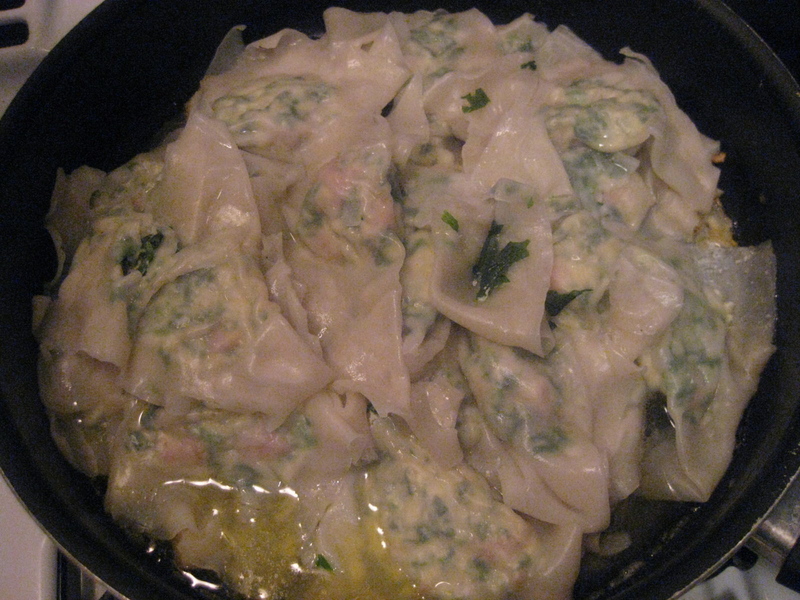 The wonton wrappers are thinner than pasta dough, so keep an eye on them or they’ll start to fall apart in the water. While those were boiling, I smashed two extra large garlic cloves and put them in a skillet with 1 Tbs butter and 1 Tbs olive oil. Keep it on medium-low so the garlic doesn’t burn, but you want a nice little simmer going on. I kept smashing the garlic more as it softened to get all the juices out. 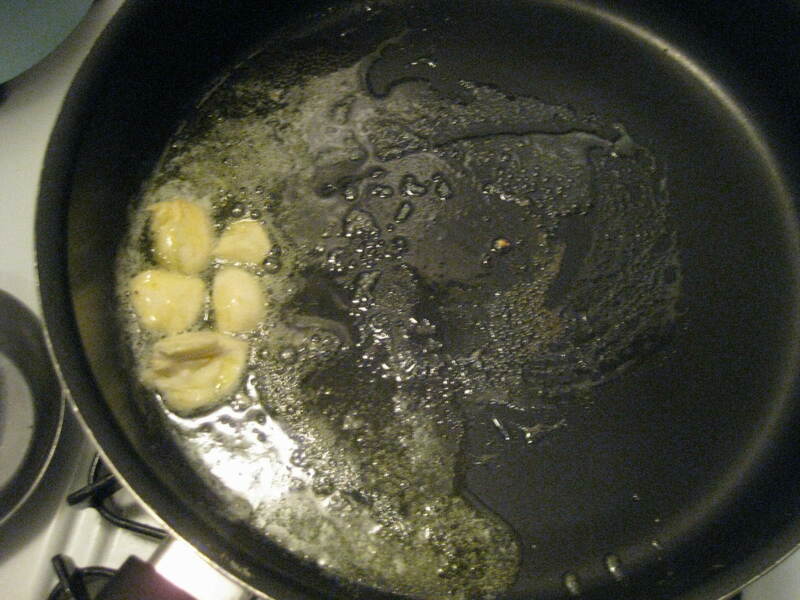 When the ravioli was done, I transfered it into the skillet with a slotted spoon instead of dumping the pot into a colander so they wouldn’t fall apart. After a few minutes, it had soaked up some of the garlic butter and boyfriend and I may or may not have actually drooled into the pan. 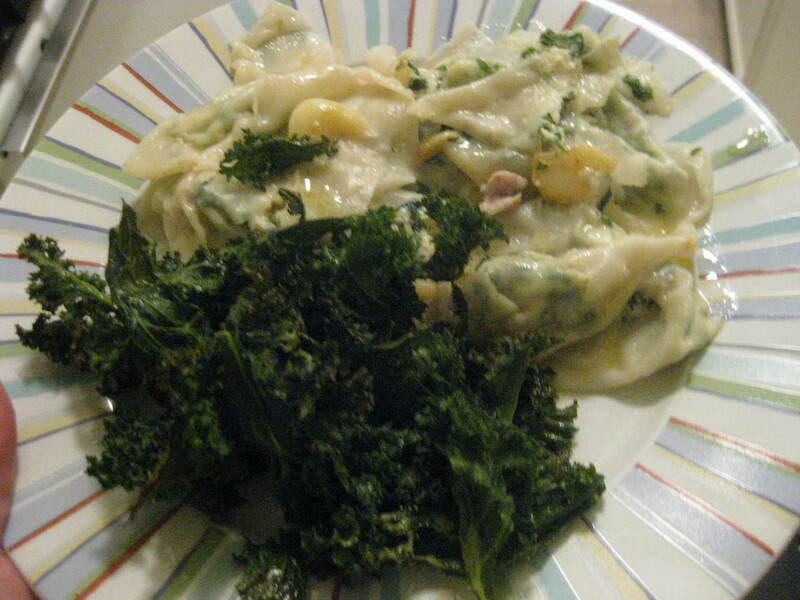 This meal (served with a hefty side of kale chips) was to die for. The flavors were so amazing. We didn’t even add salt, pepper, or parmesan (which I usually add to pasta before I even take a bite). This just stood on its own. And the garlic butter complemented it perfectly. The boyfriend said he wished we had more! So, first time making ravioli was a total success! Have you ever made ravioli/pasta from scratch?